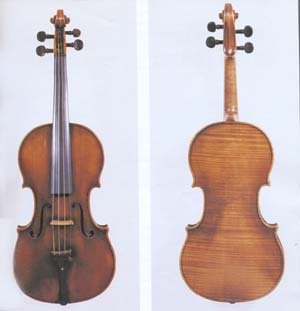 Voller Brothers Violins. Copies, Fakes, or Frauds? Working in a violin shop, we get a lot of phone calls about violins labeled "Antonius Stradivarius". (How many? Two or three each day!) Excited voices on the other end of the line will haltingly read the label out loud and tell us they just found it an attic, basement, closet, old barn, or under the bed. A lot of these are not-so-well-done factory instruments coming from Saxony and Eastern Europe. An expert can look at these violins and tell what it is before blinking. But some copies are so good they can fool most, if not all, of the "experts"!